Are you suffering and can't seem to find a way out of the darkness? Are you feeling low, unmotivated, lethargic and unhappy? Do you feel lost, or lack purpose and meaning in your life? How much misery is this causing you and your family? How much does it affect your ability to function day-to-day? How much does it impact the quality of your life? Perhaps a doctor has told you that ‘you have depression’, maybe even prescribed you some medication and sent you off for some therapy, but not much has changed – you still feel low, unmotivated, lethargic and unhappy. Well I know how you feel because I battled with depression for many years and felt desperate…but I was lucky enough to finally find some great help, after many failed attempts and almost ready to give up! This inspired me to work in the field to help others who experience similar issues. Having spent many years studying psychology and numerous other modalities, and working in the field for over 20 years now, I have the understanding, the experience and the passion to help you! 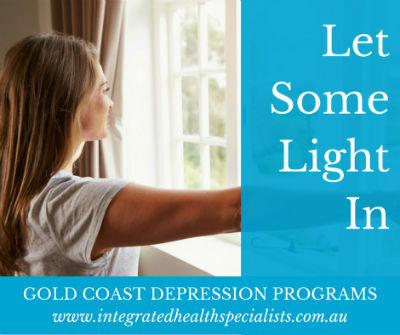 We have a well-established and highly successful program that has literally helped hundreds of people with depression and without the use of medication! Feeling down is a natural human emotion, but it is how we cope with these feelings when we feel them, is what counts. The medical system is quick to label the problem as an illness; ‘depression’ and then medicates the symptoms, whilst not addressing the causes. Too often this leads people to feel totally disempowered and then they fall deeper and deeper into depression and get stuck in the negative cycle…and then they become fearful in stopping the medication because they know nothing has changed in their life, so why would they feel any different…sound familiar? Many conventional therapists see clients for months and even years talking about their problems. From our experience, the longer you talk about the problems, the longer you stay in them! We have proven over and over again that you do not need to analyse and dissect your problems to the ‘nth’ degree to make changes and move forward! It’s your perceptions and interpretations of the problems which are the real issue, and the patterns that you have developed to cope with your problems! So to treat depression without medication, we need to address the causes, and to help you to understand why you really feel stuck and to get you back in touch with what really matters. We will also be looking closely at your current choices, decisions and behaviours. With our solutions-focused program we will show you cutting-edge psychological tools to turn the depression around and break the negative cycle. Will work together to fully understand the underlying psychological patterns (or causes) that are keeping you in a depressive cycle. We will first work with your conscious mind to increase your awareness of your thoughts, emotions, and behavioural patterns at a conscious level, and we will transform your current perceptions and disempowering beliefs that are not serving you. Then we will work directly with your unconscious mind using transformational techniques like Neuro Linguistic Programming (NLP), Emotional Freedom Techniques (EFT) and Hypnotherapy. Your unconscious mind is responsible for how you feel and how you behave, so it is vital to work with this part of your mind to ensure long-lasting changes occur! By the end of your 14 week program it’s impossible to be feeling anywhere near the way you were when you started! We have helped hundreds of people who have been on anti-depressants for many years! In fact we know that you will find this program truly life-changing, and because of this certainty we offer a full 100% money back guarantee! If you have completed all the set tasks and have attended all scheduled appointments, and you are not completely satisfied at the end of the program, we will refund your money in full. That’s how confident we are in our program! Depression can be explained in simple terms as when a person consistently experiences a low mood, they find it difficult to experience pleasure or joy, and they lose interest in life in general for long durations. If you have persistent negative thoughts about yourself and life in general, and you find it very difficult to break the negative cycle over long periods of time, and it is affecting your quality of life and your physical health; then you may be suffering from what is labelled as clinical or chronic depression. Feeling low, disappointed, lethargic, apathetic or being upset about something are part of the normal ups and downs people experience in life. The difference between depression and ‘feeling blue’ lies in its frequency, duration, as well as the degree or intensity. Allopathic medicine’s approach is to categorise a group of people together who all demonstrate similar symptoms, call it depression, and give them all the same treatment – anti-depressants! Firstly, this approach doesn’t even attempt to understand why these symptoms are present in the first place, nor what the root causes may be. This approach is merely a band aid solution; on the surface it may appear that the problem is resolved, but if you rip that band aid off and take a deeper look at the root causes of the problem, you will soon realise that the band aid (anti-depressants) are just covering up or masking the actual problems. This is also why so many people are afraid to stop taking the medications, because they fear that they will go right back to how they felt without them, as nothing has actually changed in regards to their life’s circumstances, so many become reliant upon them to function! Secondly, we are genetically different from one another with different environmental, social and lifestyle factors at play, so why should all of our treatment be the same? For example, one person’s depression may be caused by a thyroid imbalance or a vitamin B6 deficiency. Whereas, another person’s depression may be because they are very shy and suffer from low self-esteem and they find it difficult to socialise, so they isolate themselves and feel lonely. Two people with the same “dis-ease” but very different causes! Drug treatment is however, still the common allopathic approach to this mental condition. There was a very interesting study published in “The New England Journal of Medicine” which revealed that pharmaceutical companies selectively published research studies on anti-depressants: “They have published nearly all the studies that showed benefit but almost none of the studies that showed these drugs are ineffective”. This study discovered that after looking at 74 studies, incorporating 12 drugs and approximately 12,000 people, that 37 of 38 trials with positive results were actually published, whilst only 14 of 36 negative studies were published! This has given both doctors and the general public a very skewed view on the true ‘benefits’ of anti-depressants, contributing to the tremendous increase in prescription drugs for mental illness. The truth is many patients who take anti-depressants either don’t respond or only have partial success to the treatment, many people feel worse and have to suffer from harmful and uncomfortable side effects such as insomnia, weight gain, fatigue and sexual dysfunction! Holistic treatment of depression (with or without drug intervention) can provide more long-term solutions for managing depression. Apart from psychotherapy, holistic management of depression also involves exploring and modifying lifestyle choices to treat and prevent the recurrence of depression, and the use of remedial interventions and supplementation. A holistic approach to mental health has the potential to greatly improve your quality of life, and possibly reduce your reliance on medications. IMPORTANT NOTE – please do not change or stop your medications without consulting with your doctor! Disclaimer: This information is not intended to provide medical advice, diagnosis or treatment and is not a substitute for professional advice from your qualified health provider.